You will arrive at Mumbai International Airport. Following customs, immigration formalities and baggage collection, a TIWARI TOURS representative will meet you as you EXIT the ARRIVALS TERMINAL building after which you would be transferred to your hotel. Mumbai - It is young, it’s lively and a confluence of varied cultural currents and cross currents has given Mumbai a unique position of the most multi-ethnic city of India. The capital city of Maharashtra State, formerly known as Bombay lies in the southwestern part of India. Oozing with the cocksure self-confidence of a maverick moneymaker and "Bindass" (carefree) attitude, Mumbai is also country's financial and commercial hub and has a principal port on the Arabian Sea. 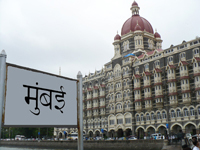 Mumbai is the hub of Indian film industry, which has played a pivoted role in the development of cinematography. "Bollywood", as it is called, produces the second most number of pictures in the world every year, next only to Hollywood, U.S.A. Mumbai claims to be the world's largest production center for films. Breakfast at hotel & Morning is at leisure. Later on The tour starts from the Gateway of India. 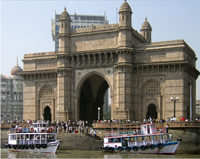 Gateway of India is the landmark of Bombay, which, was before the advent of air travel, the only gateway to India. It was built to commemorate the visit of King George and Queen Mary to India in 1911. You will be then driven along Marine Drive, the sea - Front Boulevard. It is also known as the Queen’s Necklace as in the evening, the breeze from the Arabian Sea comes over Marine Drive and as the streetlights on this U-shaped road light up, the view from south Bombay’s skyscrapers or from the exclusive residential area, is that of a Queen’s Necklace. Your first stop will be the Dhobi Ghats a huge open-air laundry, which makes an interesting viewing. Continue to Mani Bhawan (Gandhi Memorial), the house where the Father of the Nation stayed on his early visits to the city. The room, in which Gandhi stayed, preserved as it was, and the scenes of Gandhi’s life in photographs and models are of special interest. After an breakfast, in the time Our representative will meet you at the hotel lobby and transfer you to the airport in time to board your flight for Goa. Upon arrival at Goa a Our representative will meet and transfer you to the hotel, where you will proceed for check-in. 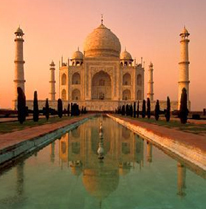 Agra in terms of ambiance is still associated with its Mughal period. The Mughals besides being great rulers were also great builders and they preserved their best architectural wonders for Agra & its neighbourhood. Arrive Agra and check inn Hotel later on afternoon to visit Agra Fort, an outstanding example of Mughal architecture. Agra Fort - the seat and the stronghold of the Mughal Empire under successive generations. This was the seat of Mughal rule and administration and the present structure owes its origins to Akbar who erected the walls and gates and the first buildings on the eastern banks of Yamuna River. Shah Jehan added the impressive quarters and the mosque while Aurangzeb added the outer ramparts. Visit its Hall of Public Audience and its Royal Pavilions. Today after breakfast Morning visit Taj Mahal (closed on Fridays). After buffet breakfast at hotel, you will be driven to Agra (235 Kms / 6 hours), en-route stop at Abhaneri Step wells. 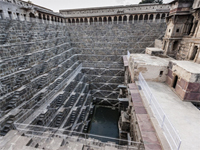 Abhaneri was named as Abha Nagri, Built during the 8th and 9th century by King Chanda of Nikumbha Dynasty, provided the surrounding areas with a dependable water source for centuries before modern water delivery systems were introduced. The huge tank with delicate carvings certainly is delightful to the eyes. There is a Harshat Mata Temple adjucent to the stepwells. This Impressive structure is over 1000 years old.. which means the city of brightness. In the present day, this city of brightness is in ruins;This colossal step well is one of India's deepest and largest step wells. This incredible square structure is 13 stories deep, and lined along the walls on three sides are double flight of steps. 3,500 narrow steps arranged in perfect symmetry descends to the bottom of the well 20 meters deep to a murky green puddle of water. After buffet breakfast at the hotel, you will be driven just outside Jaipur to the ancient capital of Amber to see the fabulous Amber Fort. Maharaja Mansingh, Mughal Emperor Akbar’s most successful General, started the construction of Amber Fort in the 17th century. In the afternoon, you will visit the city of Jaipur. Among the highlights to be seen while touring Jaipur include the City Palace, which is an overwhelming complex of exquisite palaces, gardens and courtyards, decorative art and carved doorways. The palace museum houses collections of rare manuscripts, armoury, costumes, carpets and miniature paintings. Walk to the adjacent Jantar Mantar or Astronomical Observatory made by the Maharaja of Jaipur, built in 1726 and is one of the five such astronomical wonders built by Sawai Jai Singh and makes accurate predictions even to this day. You will also have the opportunity to wander about the local markets. 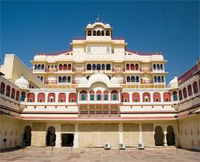 Return to your hotel after the sightseeing tour of Jaipur City. Upon arrival, our representative will meet you upon arrival & transfer you to your hotel, where you will proceed for check in. Today you will be visit to Mansa Devi temple The Maya Devi Temple holds great religious importance for the follower of Hindu religion. 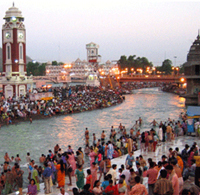 The temple is also regarded as one of the Siddhapethas dedicated to the Adhisthatri Devi of Haridwar. Before breakfast, we drive to Rishikesh - The foothill town on the banks of the holy Ganges, Rishikesh is the gateway to the beautiful Garhwal on the Himalayas. Rishikesh is located on the Tehri-Garhwal region in Uttaranchal. It is believed that Lord Vishnu vanquished the demon Madhu at this place and hence is an important place for the Hindu pilgrims from all over the world. After breakfast, we visit Lakshman Jhula- a prime tourist attraction in Rishikesh the Lakshman Jhula is a landmark in Rishikesh. The bridge is a suspension iron bridge, over the Ganges. The view from the bridge, especially during the high current of the river below, is awesome. You can enjoy the spectacular surroundings and the cool breeze from the River while from the bridge. You can also take a boat ride and view the bridge from the boat while feeding the fish in the river. Ram Jhula- another suspended bridge between Shivanand Ashram and Sawarg Ashram, Ram Jhula has been named after Laxman’s elder brother Ram. Evening return back to the hotel. Breakfast at hotel & in time transfer to Haridwar railway station to connect train for Delhi. Upon arrival in Delhi railway station and transfer you to your hotel for check in.